It is release day for Katabasis, the fourth volume of The Mongoliad Cycle, and whereas the first three volumes followed the Shield-Brethren east into the land of the Mongols, Katabasis begins the long journey home. Herein lies the consequences of their actions, as well as the realization of many arcs that have been initiated in the various SideQuests over the last year. There is a vast crypto-pagan mythology that runs beneath the surface of Foreworld, and with Katabasis, you’ll start to get glimpses of what lies beneath. All of your favorite characters return (those who survived, that is), and we’ll see the return of our friend from Rus, left behind in Kiev . . .
Beside him, Nika stirred, as if she, too, had been released from the grip of some unspeakable glamour. He shivered, as the wind had shifted again and its breath was fiercely cold once more. “Did you see . . .?” he asked, reluctant to put into words the vision he had witnessed. Nika stood close enough to him that he could make out her features in the starlit night. There was still a trace of fear in her face, but mostly Illarion saw a fierce determination in the Shield-Maiden’s eyes. “I only saw the faces of dead Skjalddis,” Nika said. Her throat worked and her eyes widened slightly. “Who is she?” Illarion asked. “They’re just stories,” Illarion protested. Illarion’s heart was pounding. He looked at Nika, and though he already knew the answer, he could not stop himself from asking, desperate that she should tell him otherwise. This is the time of year for spooky stories, and the medieval version of the camp fire story was always tales of the Wild Hunt. Michael “Tinker” Pearce and Linda Pearce return to Foreworld SideQuests with Tyr’s Hammer, a story about the origins of the cold fortress in the north. In this quick-witted and action-packed addition to The Foreworld Saga series, the leader of the Shield-Brethren has dispatched two of his men northward to secure land for a new citadel. When Tyr and his companion come upon the perfect spot, they discover that it is owned by Voldrun, a northern king with a questionable sense of justice. Although he welcomes the travelers, the king’s true motives eventually become clear. Determined to be compensated for his hospitality, Voldrun subjects the duo to several challenges, culminating in a game more dangerous than either warrior could ever have imagined. Steadfast and brave to the end, Tyr must draw upon all of his considerable skill and cunning as he endeavors to outwit the sly Voldrun and strives to secure a bright future for the order. Did we mention we’re getting into comics? We are. The Amazon publishing team has launched a comic book imprint called Jet City Comics, and we’re happy to note that the first of several Foreworld Saga serials is available for your digital comic reading. There will be a trade edition bind-up later, for those (like myself) who like to put things on shelves. The first serial is called Symposium and it is written by Christian Cameron and illustrated by Dmitri Bondarenko. Both hail from Toronto and have extensive backgrounds in the Western martial arts, though as you’ll see from the story, these two go back a ways from the Middle Ages. Symposium is the origin story of the Shield-Brethren, and it takes place in the 5th century BC when a group of disenchanted soldiers, having returned from Xenophon’s long march, start to talk of founding their own city . . .
ISSUE 1: As the soldiers of Greece return from war with Persia, they are greeted not as heroes but merely more mouths to feed. Athens is overflowing with the poor and desperate. For some of the former soldiers, this life is not why they fought. They crave adventure. They need money. More than anything, though, they long for purpose. One man may hold the answer: Plato. Not only is he versed in the art of philosophy, but he is no stranger to the art of martial combat. He believes there is a way to combine the two arts, creating a new way of life for the former soldiers. ISSUE 2: While the conservative ruling powers of decadent Athens arrange to have them watched, four young men go to a dinner party with Plato—Xenophon, the king of Macedon; a pair of Spartans; and the most beautiful woman in Athens. The question on everyone’s mind: What form would an ideal city take? The answer is a quest, and a dream . . .
Issues #1 and #2 are out now, and issue #3 will be out later this winter. Amazon announced the launch of Kindle Worlds this morning, their fan fiction happy initiative that Foreworld is participating in. This means that fan fiction has an official home as well as a storefront mechanism whereby both fans and the universe owners can participate in sales of the fan fiction to interested readers. As the Foreworld Kindle World storefront opens with ten new stories in it, it should be evident that we like this idea, and as there is a great deal of terrain to explore in Foreworld, we think this is a great opportunity for everyone to get their hands dirty in Foreworld. There’s a board on the Foreworld Forum that is specifically set up for discussion of creating fan fiction. It is our hope to build tools for the community to craft better content. As you can see from the Kindle Worlds storefront, there is a distinction between Canon and Kindle Worlds material. We’d like to see some of the Kindle Worlds material elevate itself up to Canon by its quality. This is the next iteration of the original vision for The Mongoliad and Foreworld. We had some fan fiction previously, but difficulties with technology and an ungainly wiki got in the way of things. Hopefully, Amazon’s infrastructure will make the consuming of fan fiction easier, and we’ll get the wiki sorted out on our end. All in all, ’tis a brave new world. Yes, it is. The place to get started creating Foreworld content is here. We have a forum. It’s been pretty quiet, and I’ve been waiting until Katabasis was turned in before posting the forum URL (which is, as you can probably guess: www.foreworld.com/forum). Now that the book has been sent to production, there’s no time like now to open the doors, especially since the mongoliad.com site has been shut down. There’s also a link in the menu bar so that you can find it readily in the future. During the previous iteration of our grand transmedia adventure, we had a wiki and we had an open policy about fan fiction. We’d like to see that continue. Behind the scenes, we’re working on getting the wiki data from the previous site cleaned up and we’ll present a new wiki interface soon. As to fan fiction, well, there is this new initiative called Kindle Worlds . . . 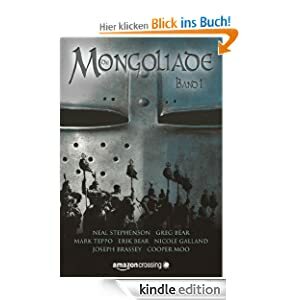 The first volume of The Mongoliad is now available in a German language edition (click on the cover below if you’d like to visit the Amazon.de site). They’re sticking with the same cover art, but the insides&emdash;oh, the insides, they are quite different. The German edition joins the Spanish translation (done by RBA). There will also be Turkish and Polish translations later this year (and into the next).